This is a weekly series about friends who have met celebs. If you have ever met any celeb and are willing to share it here, send me the picture! Mike Martz is a great guy. Mike Martz is a bit of an arrogant snoot. I have never met Mike Martz, but I know him through years of good-natured bantering in various fun pools. Nothing about Mike Martz says good-natured. Mike Martz (or Mike for the rest of this) is a friend I met through Chuck. By all accounts, Mike is a fun guy with a good amount of sports knowledge and a witty sense of humor. Mike Martz (or Martz for the rest of this) is the former Offensive Coordinator of the Chicago Bears. Martz was not well-liked here and things do seem to be better since his departure. This story does not end there. Mike met Martz several years ago at a deli and came away with a friendly encounter. No I mean a friendly encounter (which I turned into a Friendly Encounter). Mike said Martz was interested in tracing their family history. Mike was more interested in making suggestions to improve the offense. 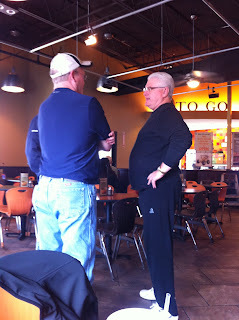 Martz could not be reached for his take on the encounter, but I am sure he walked away from Mike with a good feeling. I must also mention Mike is very patient and tolerant, as I beat the namesake joke to death during my many lengthy ramblings in the recaps of the pools. Mike could have very easily told his offensive line to let me get sacked. Oh wait, wrong one. Anyway, Mike is the first Friendly Encounter with the same name as the celeb. He also joined Coach John Wroblewski and me as only the second same name celeb picture here. I am sure Mike (and Martz for that matter) is very proud of these accomplishments! Mike Martz and Mike Martz in Vernon Hills, IL-March 2011.